Hello there! 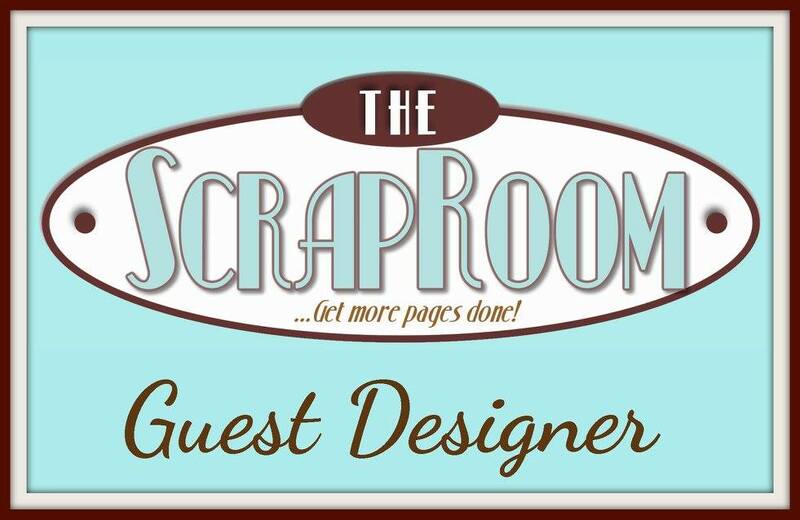 I am excited to share my first page as Guest Designer for The ScrapRoom this month! 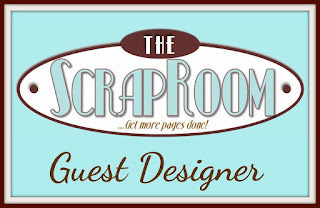 The ScrapRoom offers kits and add ons, plus coffee if you want. I was given the Flavor of the Month Kit, plus a Patterned Paper Kit and Embellishment Kit to work with this month. I have to say, what a nice selection! I really like how the kit was broken down into individual page kits. It doesn't get much easier than that to put pages together. 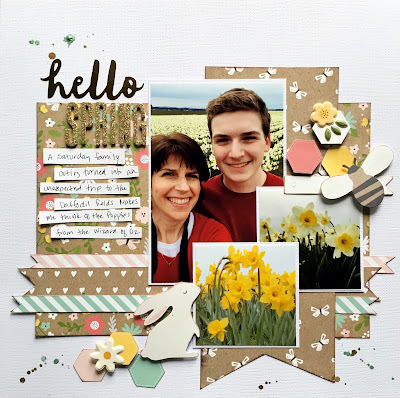 I used the Pebbles papers and embellishments from the Flavor of the Month Kit. I love printed kraft paper. And the butterflies and bees! I found them a great match for these photos. I used the sketch as it was designed, but I did make a few adjustments. First, I used a 4x6 photo accompanied by the 2 smaller ones. Second, I used the barcode strips to create 2 extra horizontal strips across the center of the page. Lastly, I moved the title up a little so I could add some journaling. As far as embellishing, I fussy cut some hexagons add some color. 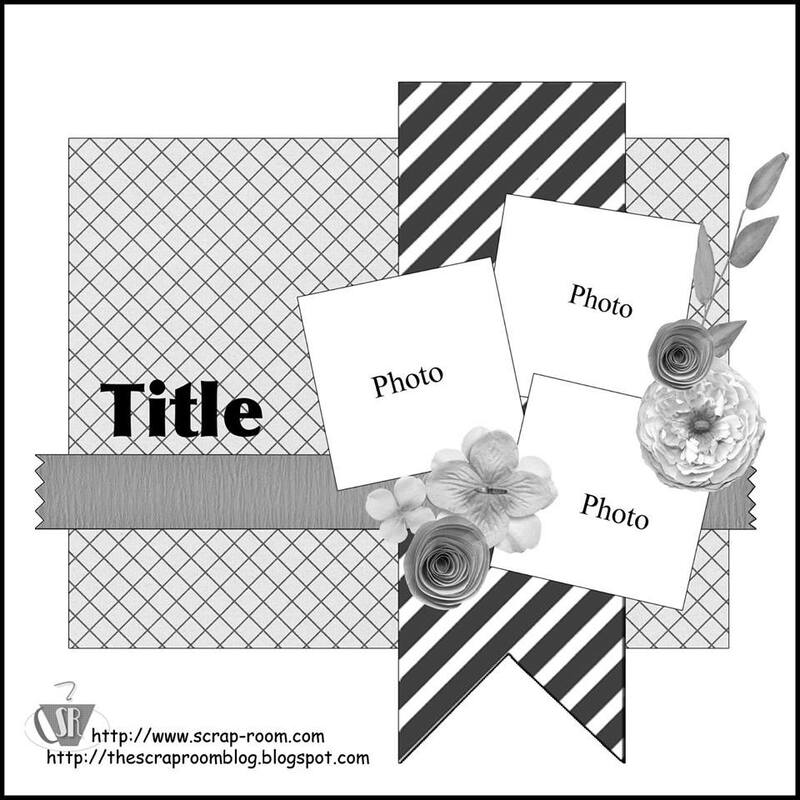 The title uses one of the words from the Sticker sheet in the Embellishment Kit. From my stash I added the alphas for the title and some mist sprinkled over the page. We are so fortunate to live close to the daffodil and tulip fields. We were on a family outing one Saturday last spring. On our way home, we found ourselves driving right through the daffodil fields. Of course we had to stop! It was cloudy, but the colors were so bright. I still can't help but think of the Poppy Fields in The Wizard of Oz though every time we visit. Thank you so much for stopping by my creative view today. I'm going to be very busy this month, so come back often to see what's going on. Great page, and this looks like a fun kit!